Ev and I have been on a bit of a salmon kick lately, making the most of the last of the fresh caught salmon this season. It’s still available over winter, just frozen and a little more expensive – though the price here in Seattle has nothing on how much even farmed Atlantic salmon would cost in Australia. When my parents were visiting us over Easter this year, they went through the same shock that we did when we moved to Seattle – Salmon is how cheap? There are so many varieties! You can get wild caught salmon in the supermarket, without going to a fishmonger?! Bliss. I have a feeling that the reason they are going to visit us again next summer has something to do with the salmon (and the dogs) and less to do with us. When we eventually move from Seattle, we will definitely miss the fresh seafood. Not that we don’t have a plentiful supply of fresh seafood in Australia, it’s just much more affordable over here. Salmon is a very healthy and abundant source of omega 3/healthy fats, protein – with all the essential amino acids present (22 g/100 g), vitamins B-6 and -12, and selenium, as well as containing moderate amounts of potassium, phosphorous and the other B group vitamins. Definitely something that should be a regular part of an healthy diet for those who eat meat. Lemon is a low FODMAP fruit. Use slightly sweet, juicy lemons, not bitter lemons, which can impart the bitterness onto the salmon – been there, done that. It can really spoil an otherwise delicious meal. Oregano is low FODMAP but does contain salicylates, which can also cause IBS symptoms. But once again, low FODMAP. Butter is lower in lactose due to its reduced water content, though for a dairy free/lactose free version you could use coconut oil or a dairy free spread of your choice for a different, though just as tasty flavour. Clean and fillet your salmon, if not already done – leave the skin on. Rinse and pat dry the salmon, before slicing 4-5 x 1 cm deep slices into the skin. This will require a sharp knife, as the skin can be quite tough. 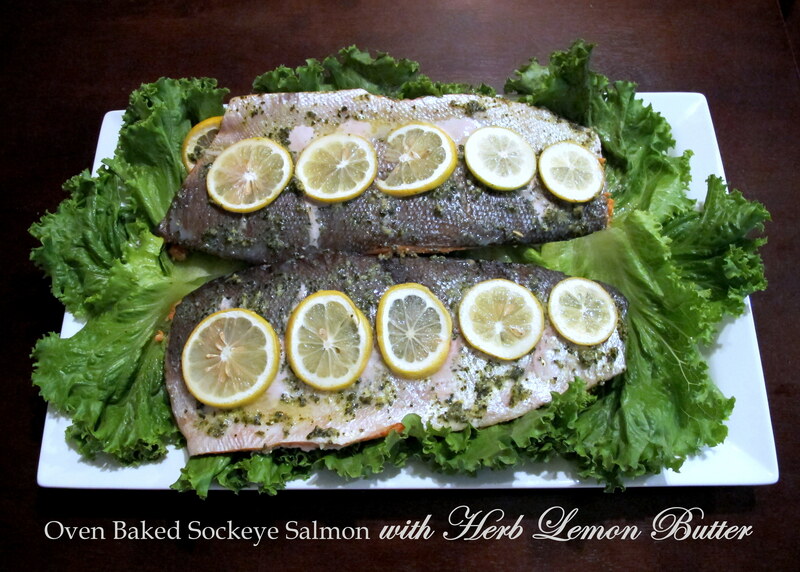 Choose your baking dish and lay down a bed of the lemon slices, on which you will later lay the salmon. In a food processor, combine the oregano leaves, butter, garlic oil, lemon juice, sea salt and pepper and blend until smooth, the leaves should end up finely shredded. Rub the mixture on both sides of each salmon fillet, before placing them skin side UP on the lemon rounds. 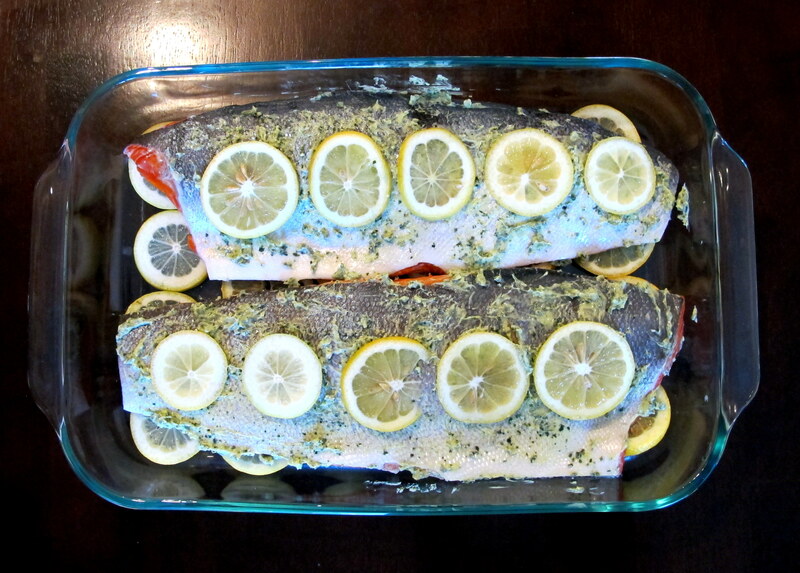 Cover in foil and store in the refrigerator for at least an hour, to let the flavours seep into the fish. Preheat your oven to 180 C/350 F; when ready, place the covered tray on the middle shelf and bake for 20 minutes, at which point you’ll remove the foil and bake for a further 10 minutes. If your fish is smaller, it might not need any more time, or 5 minutes at the most. Keep an eye on it. 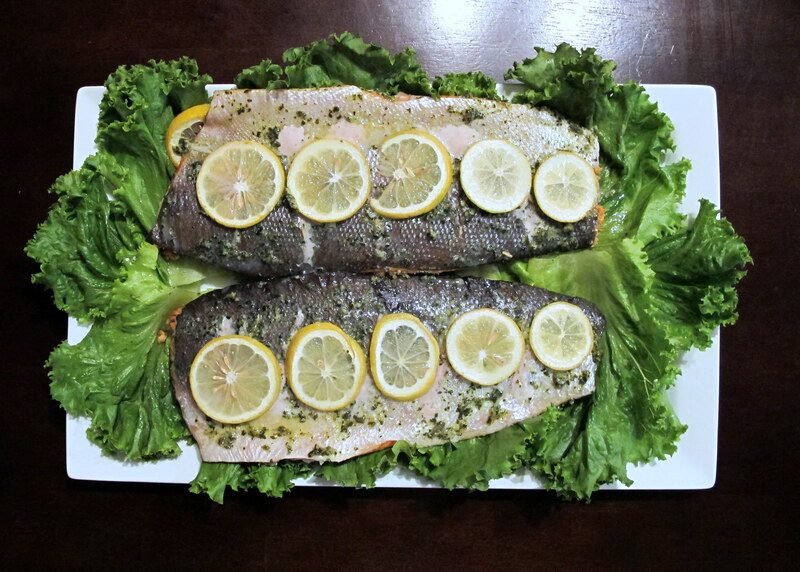 Once the fish is flaking apart, remove it from the oven and carefully lay it on a bed of greens. The skin will peel off easily, for those who don’t wish to eat it. The lemon livens up the salmon’s natural flavours, while the butter and oregano play very well with everything. 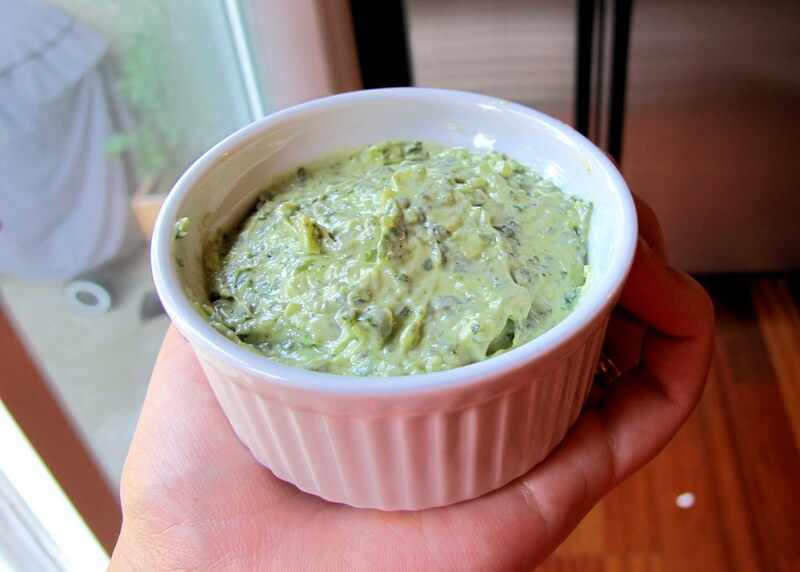 Delicious and a definite crowd pleaser… enjoy! This entry was posted in Carnivore, Dinner / Mains, Seafood Mains and tagged Australia, black pepper, dinner, eat clean, fish, FODMAP, FODMAPS, food, fresh, fructose friendly, fructose malabsorption, fruit, gluten free, healthy, home-cooked, homemade, lemon, low fructose, low sugar, oregano, Pacific Northwest, paleo, pescetarian, primal, salmon, sea salt, Seattle, sockeye salmon, wild caught. Bookmark the permalink.